2 Commercial Real Estate & Properties in Campsie are listed in 1 categories. We have 2 Development LandsSale . Well presented and rejuvenated throughout is this low maintenance, 2 storey block of residential units comprising 7 apartments all renovated with open plan living areas and updated kitchens and bathrooms. 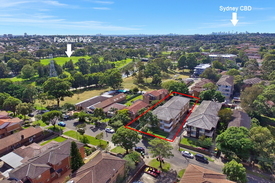 Currently all leased and ideally positioned only a short stroll to Campsie shops, amenities, public transport and local schools. Solid, full brick 2 level boutique block of only 7 strata units 7 x 2 large 2 bedroom apartments with versatile, spacious floor plans Each unit with balconies, internal laundries and lock up garages Ideal investment and future development opportunity stca 1,108.92sqm block with 18.7m frontage approx., Zoning: R4 High Density Disclaimer: Some photos have been virtually styled. The information presented has been furnished from sources we deem to be reliable. All interested parties should rely on their own enquiries in order to determine the accuracy of this information.